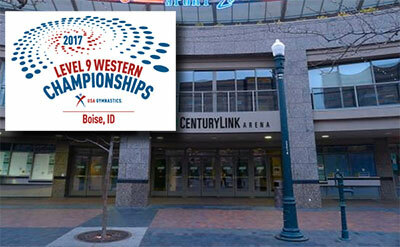 BOISE, Idaho, May 1, 2017 – Region 1 won the Super Team title at the 2017 Women’s Junior Olympic Level 9 Western Championships held at CenturyLink Arena in Boise, Idaho. Over the three days, 455 female gymnasts competed in the Junior Olympic Western Championships that, along with the Junior Olympic Eastern Championships, is the culmination of the competitive season for Level 9. Region 1 won the Super Team title, with Region 3 coming in second. Region 4 was third, followed by Region 2. Junior 1 – 1. Kaliya Lincoln, Hayward, Calif./Airborne Gymnastics Training Center, 38.275; 2. Lundyn Vandertoolen, Salt Lake City, Utah/Olympus Gymnastics, 38.175; 3. Londyn Daniel, Edmond, Okla./Dynamo Gymnastics, 37.925. Team – 1. Region 1, 151.875; 2, Region 3, 150.550; 3. Region 4, 148.275; 4. Region 2, 140.425. Junior 2 – 1. Ui Soma, Honolulu, Hawaii/San Mateo Gymnastics, 38.250; 2. November Lenz, Broken Arrow, Okla./Dynamo Gymnastics, 38.100; 3. Destiny Denning, Henderson, Nev./Grace Gymnastics, 37.675. Team – 1. Region 1, 151.775; 2. Region 3, 149.825; 3. Region 4, 148.300; 4. Region 2, 146.900. Junior 3 – 1. Madison Raesly, Lantana, Texas/Texas Dreams Gymnastics, 38.600; 2. Jessica Lin, Tustin, Calif./South Coast Gymnastics, 37.775; 3. Mia Heather, San Francisco, Calif./San Mateo Gymnastics, 37.700. Team – 1. Region 1, 151.375; 2. Region 3, 151.150; 3. Region 4, 147.850; 4. Region 2, 142.550. Junior 4 – 1. Jaly Jones, Williamsburg, Iowa/Iowa Gymnastics Academy, 37.875; 2. Kylie Chin, Sammamish, Wash./Gymnastics East, 37.675; 3. Emily Erb, Reno, Nev./Flips USA Gymnastics, 37.450, 37.450. Team – 1. Region 4, 149.775; 2. Region 3, 149.650; 3. Region 1, 148.475; 4. Region 2, 145.675. Junior 5 – 1. Kylee Burton, Prosper, Texas/Metroplex Gymnastics, 38.425; 2. Aisha Gaither, Kansas City, Mo./Great American Gymnastics Express, 38.125; 3. Ava Obenberger, La Porte, Texas/AIM Athletics Texans Gymnastics, 37.850. Team – 1. Region 3, 151.650; 2. Region 1, 150.100; 3. Region 4, 150.025; 4. Region 2, 142.500. Junior 6 – 1. Morgan Thomson, San Diego, Calif./SCEGA Gymnastics, 38.075; 2. Aiko Hirata, San Antonio, Texas/Aerial Athletics, 37.900; 3. Gigi DeGeorge, Owasso, Okla./Dynamo Gymnastics, 37.800. Team – 1. Region 1, 151.925; 2. Region 3, 151.425; 3. Region 4, 147.800; 4. Region 2, 145.925. Junior 7 – 1. Malia Marquez, San Jose, Calif./Airborne Gymnastics Training Center, 37.900; 2. Paige Wong, Houston, Texas/Stars Gymnastics Training Center-Houston, 37.800; 3. Emerson Adams, Wichita, Kansas/JAG Gymnastics, 37.625. Team – 1. Region 3, 150.825; 2. Region 2, 149.650; 3. Region 1, 149.225; 4. Region 4, 148.250. Junior 8 – 1. Keanna Abraham, Bakersfield, Calif./American Kids Sports Center, 38.200; 2. Kaitlyn Lam, Phillips Ranch, Calif./Charter Oak Gymnastics, 38.150; 3. Dylan Boehmer, Grain Valley, Mo./Great American Gymnastics Express, 37.425. Team – 1. Region 1, 151.350; 2. Region 4, 148.175; 3. Region 3, 148.025; 4. Region 2, 145.900. Senior 1 – 1. Alexa Ebeling, Adel, Iowa/Chow’s Gymnastics and Dance Institute, 37.975; 2. Josie Bergstrom, Boyden, Iowa/All American Gymnastics Academy, 37.900; 3. Kendra Layton, Gilbert, Ariz./Carters Gymnastics Academy, 37.700. Team – 1. Region 1, 151.400; 2. Region 4, 149.825; 3. Region 2, 148.650; 4. Region 3, 148.125. Senior 2 – 1. Megan Travia, Menomonee Falls, Wis./LaFleur Academy of Gymnastics, 37.975; 2. Makayla McMahon, Clovis, Calif./V-FORCE Elite, 37.750; 3. Alyssa Coutu, Plano, Texas/Metroplex Gymnastics, 37.700. Team – 1. Region 1, 150.950; 2. Region 4, 149.475; 3. Region 3, 148.800; 4. Region 2, 146.275. Senior 3 – 1. Anya Ishida, Bonney Lake, Wash./Auburn Gymnastics Center, 38.125; 2. Jayden Weaver, Pawnee, Okla./Dynamo Gymnastics, 38.100; 3. Kira Lim, Penngrove, Calif./Redwood Empire Gymnastics, 37.650. Team – 1. Region 1, 150.750; 2. Region 3, 149.275; 3. Region 2, 148.300; 4. Region 4, 148.200. Senior 4 – 1. Alyssa Van Allen, Litchfield Park, Ariz./Impact Gymnastics Academy, 37.875; 2. Nicole Garcia, Rogers, Ark./Aspire Gymnastics Academy, and Heather Aga, Rowlett, Texas/Precision Gymnastics Tumbling, 37.475. Team – 1. Region 1, 150.400; 2. Region 3, 149.850; 3. Region 4, 149.425. Senior 5 – 1. Anna Bramblett, Cottonwood, Ariz./Arizona Dreams Gymnastics Academy, 38.175; 2. Kaya Allison, Berkeley, Calif./Head Over Heels, 38.075; 3. Kenadi Brown, Las Vegas, Nev./Gymcats Gymnastics, 37.475. Team – 1. Region 1, 151.175; 2. Region 3, 149.300; 3. Region 4, 146.950; 4. Region 2, 144.675. Senior 6 – 1. Cameron Kelperis, Long Beach, Calif./American Gymnastics Academy of Long Beach, 37.650; 2. Jessica Holder, Las Vegas, Nev./Gymcats Gymnastics, 37.600; 3. MaKenzie Bullitt, Garland, Texas/Precision Gymnastics Tumbling, 37.400. Team – 1. Region 1, 150.075; 2. Region 3, 148.975; 3. Region 4, 146.450; 4. Region 2, 146.125. Senior 7 – 1. Alexis Mather, Taylorsville, Utah/Olympus Gymnastics, 38.125; 2. Brooke Merila, Albertville, Minn./Twin City Twisters, 37.475; 3. Ariel Toomey, Tacoma, Wash./Cascade Elite West, 37.450. Team – 1. Region 4, 150.000; 2. Region 2, 149.225; 3. Region 1, 148.725; 4. Region 3, 147.550. Senior 8 – 1. Amani Johnson, Albuquerque, N.M./Gold Cup Gymnastics, 37.475; 2. Melina Lopatin, St. Louis, Mo./Team Central, 37.375; 3. Breann Sanford, Boulder City, Nev./Gymcats Gymnastics, 37.125. Team – 1. Region 1, 147.850; 2. Region 3, 147.450; 3. Region 4, 146.700; 4. Region 2, 146.525. Region 2 organized the successful 2017 Junior Olympic Western Championships, which featured the top seven Level 9 gymnasts from USA Gymnastics Regions 1-4 in 16 age divisions that are determined by birth date. The states that comprise each region are: Region 1 — Arizona, California, Nevada, Utah; Region 2 – Alaska, Hawaii, Idaho, Montana, Oregon, Washington; Region 3 – Arkansas, Colorado, Kansas, New Mexico, Oklahoma, Texas, Wyoming; and Region 4 – Iowa, Minnesota, Missouri, Nebraska, North Dakota, South Dakota, Wisconsin.